The recommended dose is 5 g of gel (i.e., 50 mg of testosterone) applied once a day at about the same time, preferably in the morning. Individual daily dose can be adjusted by the doctor depending on clinical and laboratory parameters in patients, but should not exceed 10 g of gel per day. Correction of the dosing regimen should be performed in steps of 2.5 g of gel per day. The gel is applied to clean dry undamaged skin of the shoulders, forearms and / or abdomen. After opening the sachet, it is necessary to immediately apply all of its contents to the skin and distribute it in a thin layer. Do not necessarily rub it into the skin. Allow it to dry for at least 3-5 minutes before dressing. After applying the gel - wash your hands with soap and water. Do not apply the gel to the genital area since a high content of ethyl alcohol in the preparation can cause local irritation. 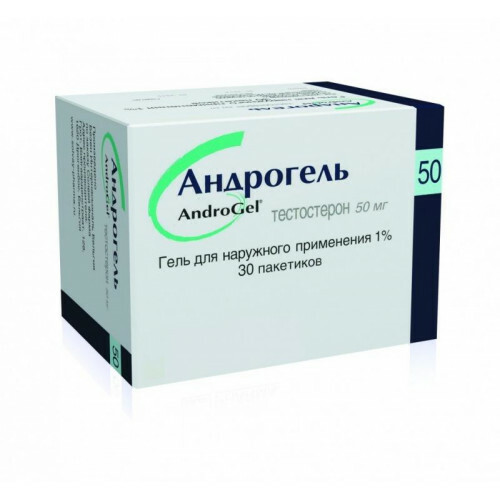 The constant concentration of testosterone in the plasma is reached approximately on the second day of treatment by Androgel®. To adjust the dose of testosterone - it is necessary to determine the concentration of testosterone in the serum in the morning, before the drug, from the third day after the start of treatment (within one week). Dosage can be reduced if the testosterone content in the plasma is increased. If the concentrations are low, the dose can be increased, but not more than 10 g of gel per day.